About two weeks ago, we were loaded onto a tour bus that was heading to Burntcoat Head Park on the Bay of Fundy, site of the world’s highest tides. There, we were to be treated to a feast on the ocean floor, paired with the new line of Alexander Keith’s small-batch brews, which are being made at the original Lower Water Street location in Halifax. The bus ride to Hants County, Nova Scotia, took about an hour and a half from Halifax. After arriving at the park we were separated into two smaller groups and taken on tours. The constant mist and generally grey skies didn’t take away from the spectacular topography and stunning formations along the ocean floor, where the world’s highest tides ebb and flow. Most of us were wearing the proper footwear, so we trudged close to the ocean, checking out tidal pools and tiny crabs along the way. Once returning from the tour we were greeted with an East Coast-style shellfish boil, complete with live Maritime-inspired music and lots of cold beer. We were each given a huge bowl of boiled mussels, clams and lobster claws, topped with fried dulse, accompanied by a delicious homemade biscuit. Lounging in a circle of colourful Adirondack chairs, we took turns throwing our empty shells into galvanized steel buckets that were placed in the centre. We were supplied with a seemingly unlimited amount of Keith’s newest small batch creation, Fundy Lowtide WIPA, a white IPA made with sea lettuce and dulce from the Bay of Fundy. Second course surf and turf, succotash. We headed back to the ocean floor, where a long white tent was set up for dinner. Tables decorated with tartan and centrepieces made of sea greenery were set up in the sand, waiting for us. First course was a cheese and house-made charcuterie plate with crispy flat bread crackers and mustards, which was intended to pair with Keith’s best-known beer, their India Pale Ale. 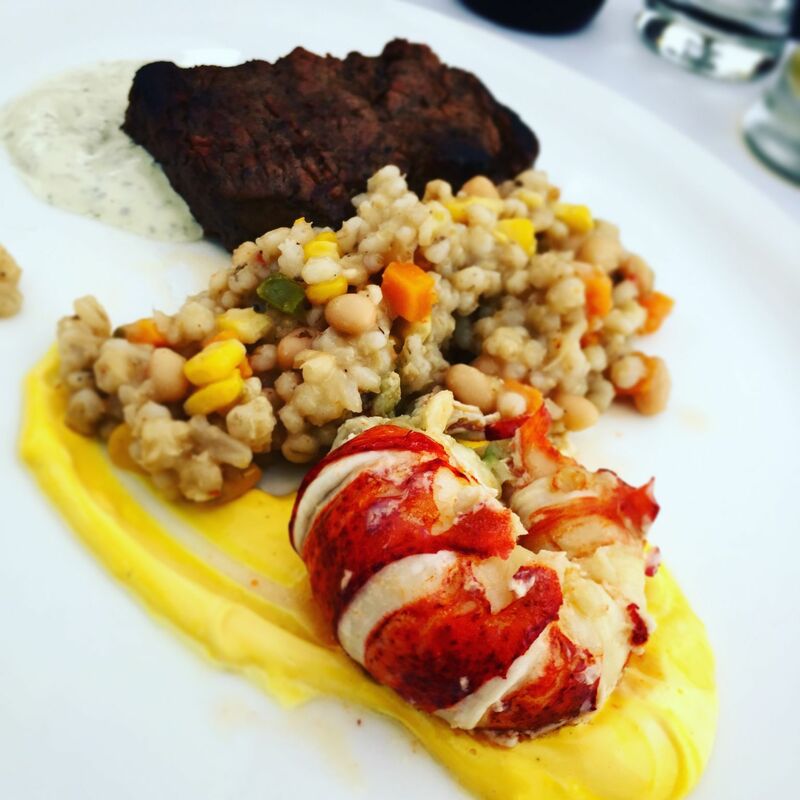 The main course was a generous surf and turf, featuring a super flavourful poached lobster tail with saffron mayo, toasted barley succotash, and hop-crusted beef tenderloin; this was paired with Keith’s Cornerstone EPA. Dessert was wonderful, a stack of layered airy cinnamon phyllo, chocolate mascarpone cream, and sautéed cherries, topped with crunchy, pure cocoa nibs, paired with Keith’s Lunenburg Coffee & Cocoa Stout. The brewmaster, Stefan Gagliardi, acted as a host of sorts, mingling with guests and introducing each beer before courses at dinner. This event was catered by Flying Apron Cookery, and was put on by Seaboost and Labatt (who own Keith’s). I was invited complimentary as part of a media and industry group. Dinner setup on the ocean floor. First course charcuterie and cheese. Dessert: Phyllo, coffee mascarpone, cherries. Just prior to Nova Scotia’s busy tourist season starting to take off, we snuck away for one precious night in Indian Harbour, at the gorgeous Oceanstone Resort. Located only five minutes from Peggy’s Cove, a trip to Oceanstone from Halifax proves to be just far enough outside the city to let yourself relax, for real. We stayed in Gray Owl cottage, which allowed us to walk directly onto the beach from the back entrance. A raised deck surrounded by trees and foliage offers privacy without blocking the dreamy, straight-on view of the ocean. Individual fire pits on the beach, along with cozy wood stoves inside, allow for the ultimate cottage experience. The layout of Gray Owl is perfect for a couple: a one room open-concept cottage with high ceilings, decorated with upscale rustic charm. Although it was foggy when we first arrived, the sun soon burst through and we kicked off our shoes to set up shop in the sand and enjoy a beverage. The early evening sun was hot enough to fight off the cool ocean breeze; the backdrop and soundtrack were absolutely unbeatable. We stayed there until we were too cold, then retreated to enjoy the wood stove inside. After an extended period of intense relaxing (virtually doing nothing) we got to work on dinner. We used the outdoor barbecue to grill beef tenderloins from Getaway Farms with bone marrow butter (my first time picking this up — delicious), along with grilled vegetables and creamy mash. A perfect evening. We fell asleep on the insanely comfortable bed (which you can see the ocean from, by the way) with the window slightly cracked, the sounds of crashing waves wandering in. Oceanstone is definitely my new go-to for an easy, calm and quick getaway from Halifax. The perfect place to recharge. The coziest… Grey Owl Cottage. Tenderloin on the BBQ for dinner! On one of the first truly warm, sunny days in May, I was invited to attend another fantastic Ford Canada event. This time, we’d be headed to Oceanstone Seaside Resort near Peggys Cove, to hear author, TV host and travel columnist Robin Esrock speak about his new book The Great Atlantic Canadian Bucket List. When I arrive at our meeting point, Steele Lincoln Ford, I see my co-writers at Local Connections Halifax Magazine, Lia Rinaldo and Tiffany Thornton. 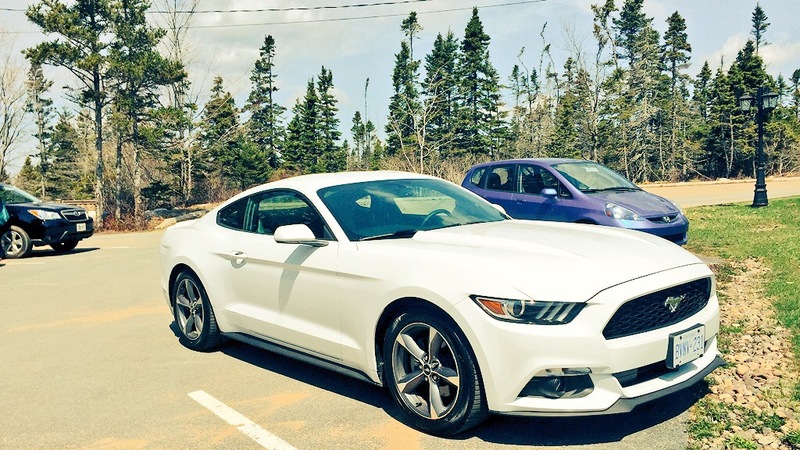 We manage to nab the white Ford Mustang and Lia gladly agrees to get behind the wheel for the 40-minute(ish) road trip to Oceanstone. Upon arrival we’re immediately swept out to a deck overlooking the ocean, snacking on delicious canapés (smoked salmon crostini and bacon-wrapped scallops) while sipping on Benjamin Bridge Nova 7 sparkling wine. Nova 7 on the patio. It’s the kind of day in early spring where you finally feel everything has come back to life. 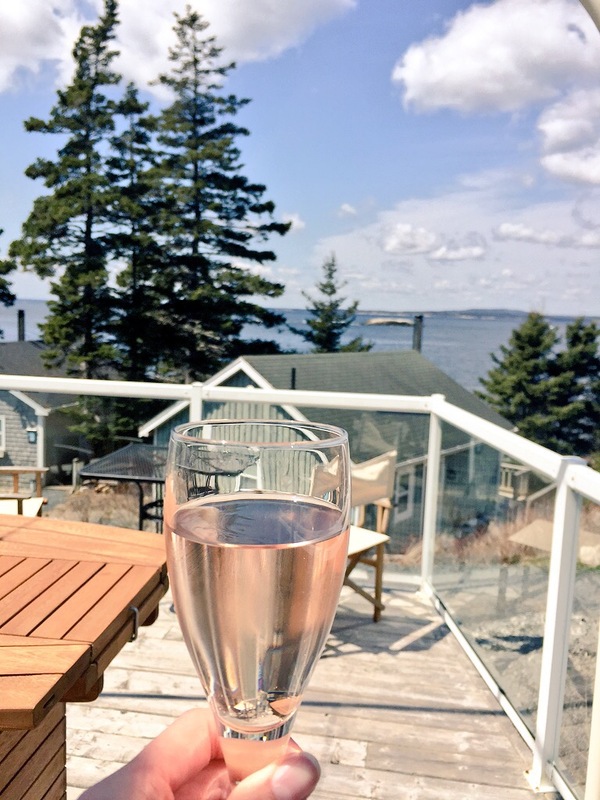 The air smells pleasantly salty, the breeze is warm and the deck offers a quintessential Nova Scotia view: a white lighthouse across the bay and a stunning combination of rocky beach and blue ocean. Operator Lizzie Moore speaks to us briefly about the property and promises to show us around the cottages after lunch. First course for our lunch is hands-on oyster shucking (and eating) with chef Bryan Corkery. 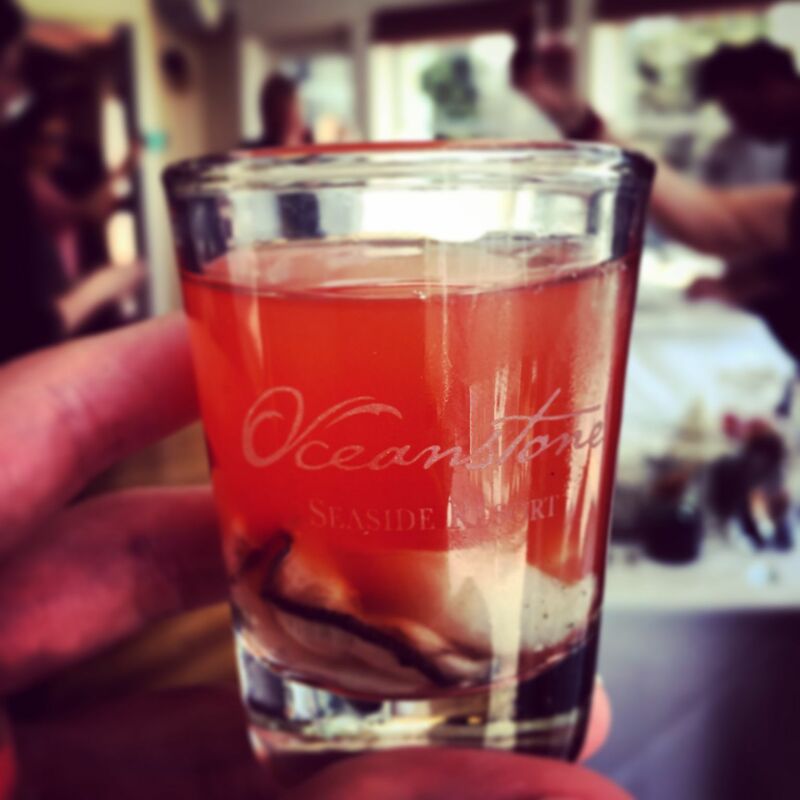 After the demo, a few of us shuck our own, and Bryan makes oyster shooters with clamato juice and vodka. At this point I’m glad Lia has agreed to drive the Mustang. We sit down for lunch (lobster stuffed chicken, potato rosti and seasonal vegetables). Sometime during dessert Robin takes over for a presentation about his travel experiences and books The Great Canadian Bucket List, and now, the Great Atlantic Canadian Bucket List. The storytelling and photos are the type that immediately make you want to quit your day job and buy an around-the-world plane ticket. But if you can’t do that, for now, you should at least check out his book on Atlantic Canada and plan some adventures closer to home. After lunch, as promised, we take a look through some of the seaside cottages (which are unbelievably charming) and soak in the sun, view and ocean air just a little bit longer. I manage to win the prize draw (one night in a Rhubarb suite), which means I’ll be back soon, to eat fresh seafood at the on-site restaurant Rhubarb, and drink Nova 7 by our fire pit on the beach, listening to the waves crash in front of our beautiful cottage. Because there’s no way I’m not upgrading! Getting on the road with Lia and Tiffany. Delicious canapés on the deck when we arrive. Chef Bryan Corkery giving an oyster shucking demo. Chef Bryan Corkery making oyster shooters. Robin Esrock learning to shuck oysters. Robin’s presentation about the Great Atlantic Canadian Bucket List (his newest book). Great views from the cottage deck.